Advanced Car Exports is once again offering huge discounts on new, tax-free Fords, both RHD UK-spec and LHD Continental-spec, all for export outside the UK. S-Max Titanium 2.0 TDCi 140ps 6-speed manual in Frozen white. £15,895 on the road, tax-free. S-Max Titanium 2.0 TDCi 140ps in various metallic finishes. £16,245 on the road, tax-free. Ford S-Max Road Test and Video. 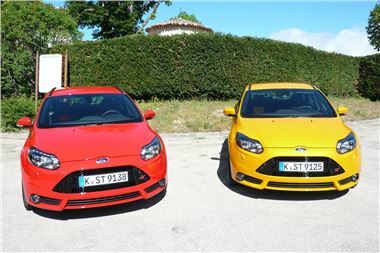 Ford Focus ST Road Test and Video. All above are full UK spec RHD, same as offered to local UK customers. LHD prices on request. Prices include £55 first registration fee and number plates, but not first year UK VED or 20% UK VAT. Delivery through award-winning Ford dealership, Cuff Miller Ltd, Littlehampton, West Sussex.